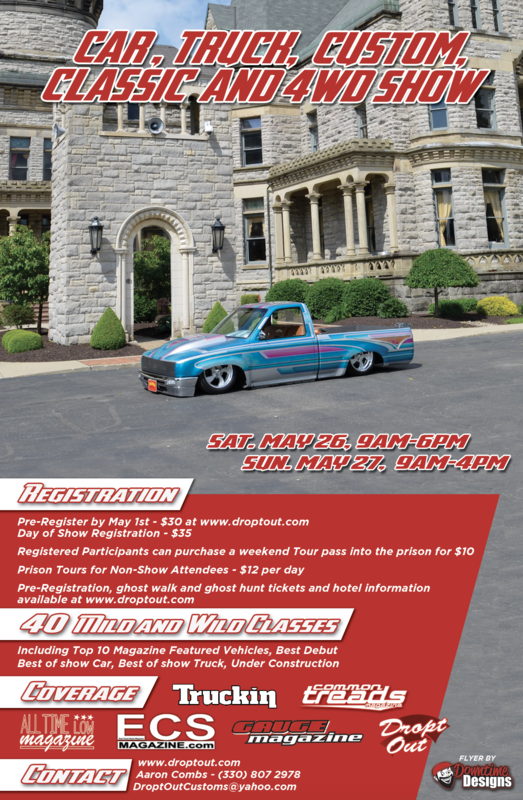 This is Dropt Out's 14th annual Dropt n Destroyed custom car & truck show held on May 26-27, 2018. We will be at The Ohio State Reformatory located at 100 Reformatory Rd. Mansfield, Ohio 44905. The prison will be available for tours and photo opps. Gates open at 9am Saturday/Sunday with ALL (vendor, sponsor, show members) vehicles filling out a registration form. The gates will be closed each night at 6pm (six). Awards will be Sunday at 3:30pm w/ special awards as longest distance, best paint car & truck, engine car & truck, no shine award, best of show car & truck and our class awards. All times, events, awards subject to change (but we like to keep to them).